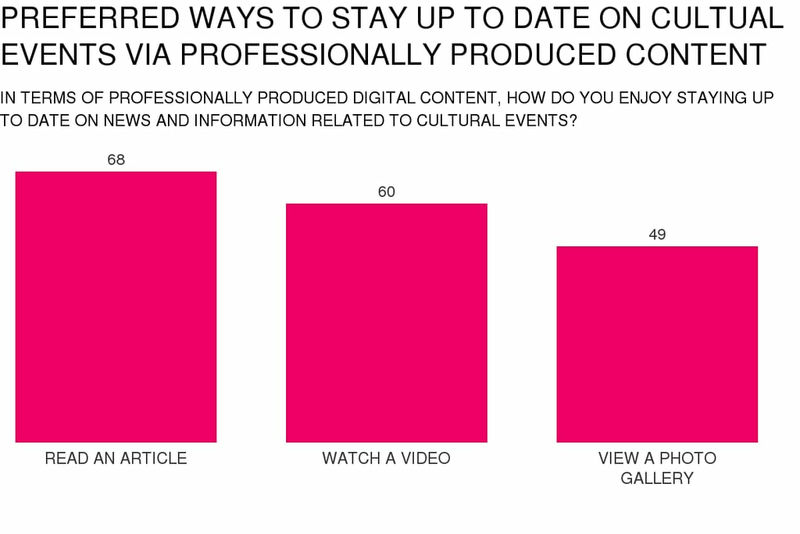 Online, women have three primary ways of interacting with professionally produced digital content. As part of the POPSUGAR Insights Content, Commerce, and Culture study, we surveyed over 1,500 women between the ages of 18-44 and asked them to share their preferences for staying up to date on news and information related to cultural events. Overall, 68% of women enjoy reading articles. For many women, text-based articles describing the events are still the preferred way to consume content related to cultural events. Sixty percent of women enjoy watching videos, proving that the emotional connection that strong video content creates makes for a compelling content-consumption experience. Forty-nine percent of women enjoy viewing a photo gallery, allowing them the opportunity to view many different perspectives on the event, such as viewing the different acts who performed or reviewing what each actress wore on the red carpet at the Academy Awards.